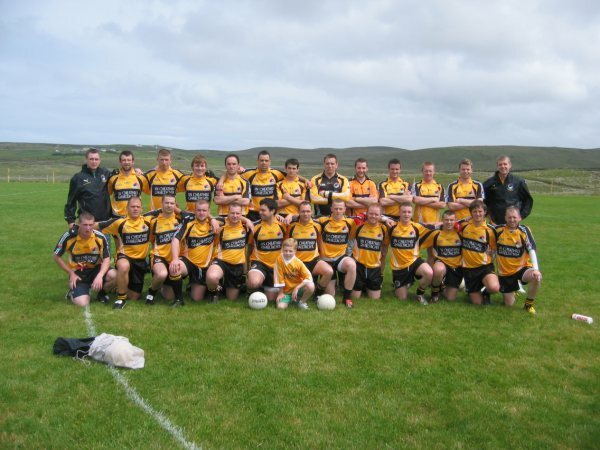 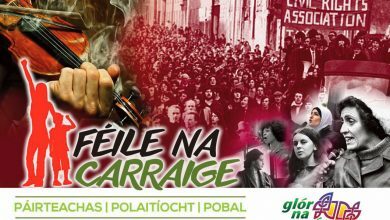 Sheol Glór na Móna clár fhéile bhliaintiúil s’acu, Féile na Carraige. 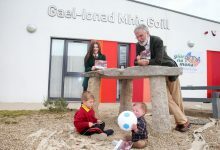 Léirigh ionadaí agus gníomhaí pobail chomh maith le daltaí na scoileanna áitiúla, Bunscoil an tSléibhe Dhuibh agus Galescoil na Móna a gcuid tacaíochta agus baineadh sult as an chraic, ceol agus bia i Leabharlann na Carraige Báine. 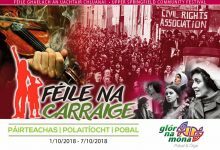 Tá Féile na Carraige pacáilte i mbliana le himeachtaí do chách sa phobal. 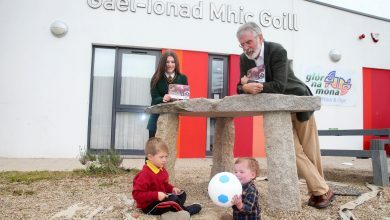 Beidh maidin chaife agus ceoil i gColáiste Feirste do phinsinéirí, ceardlann amhránaíochta do pháistí óga. 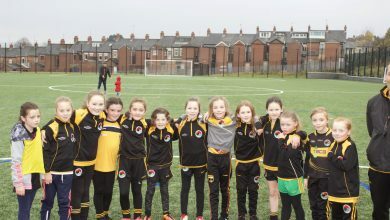 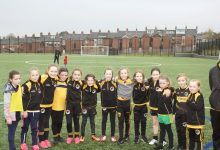 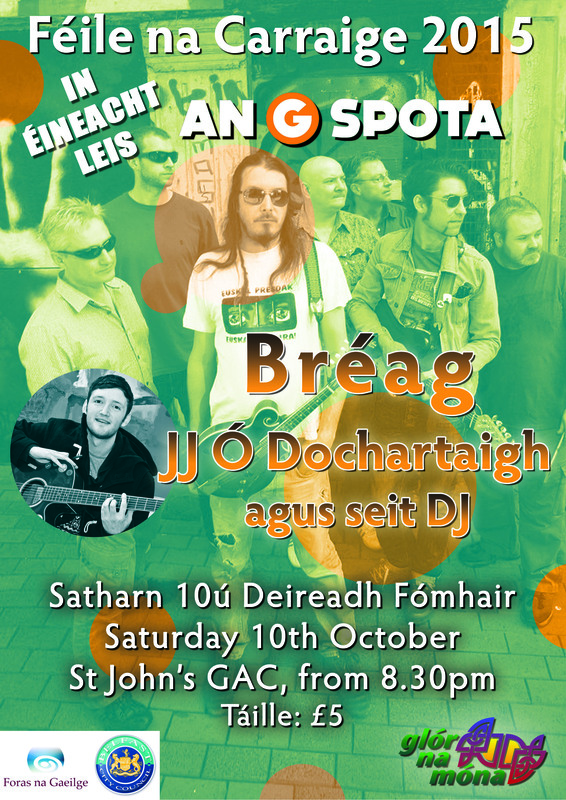 Bheirfidh Plúra Lúra agus na Bopóga cuairt ar na naíscoileanna áitiúla agus beidh lá teaghlaidh againn ar an Satharn i mBunscoil an tSléibhe Dhuibh Beidh an G Spota ar chuairt go Naomh Eoin le sár cheol ó J.J Ó’Dochartaigh agus Bréag agus beidh an dráma ard-mholta 1981 ar ardán Ghort na Móna ar an oíche Aoine. 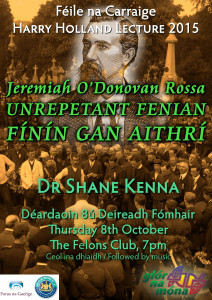 Lena chois sin, beidh ár léacht bhliaintiúil, Leácht Harry Holland againn leis an Dr Shane McKenna ag amharc ar “O’Donnabháin Rosa: Finín gan Aithrí”chomh maith le neart eile. 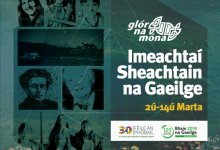 Tá rud inteacht do ghach ag Féile na Carraige 2015. 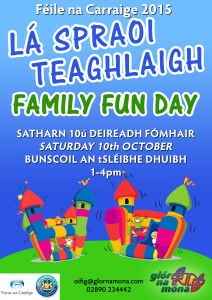 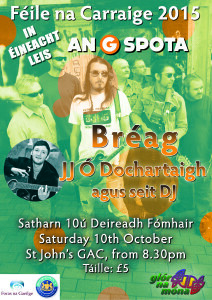 Gabhann Glór na Móna buíochas le Foras na Gaeilge, RCEF agus Comhairle Bhéal Feirste as a dtacaíocht i leith na féile. 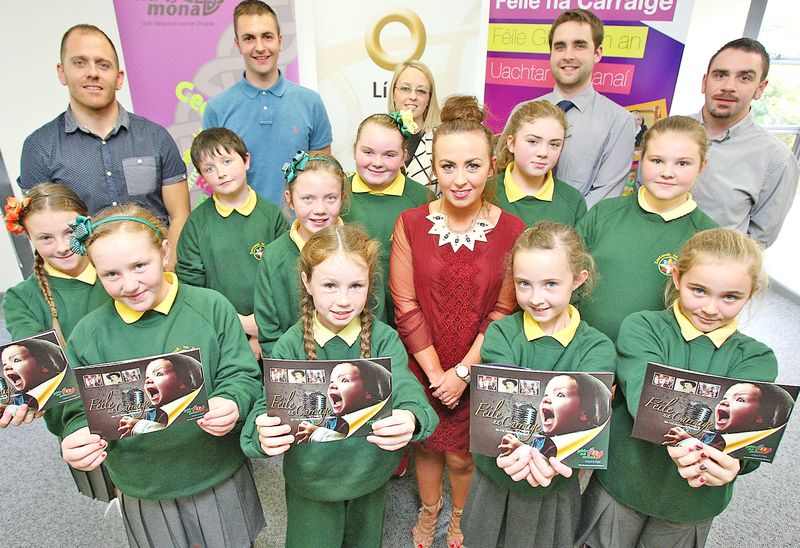 Glór na Móna launched the programme for their annual festival, Féile na Carraige. 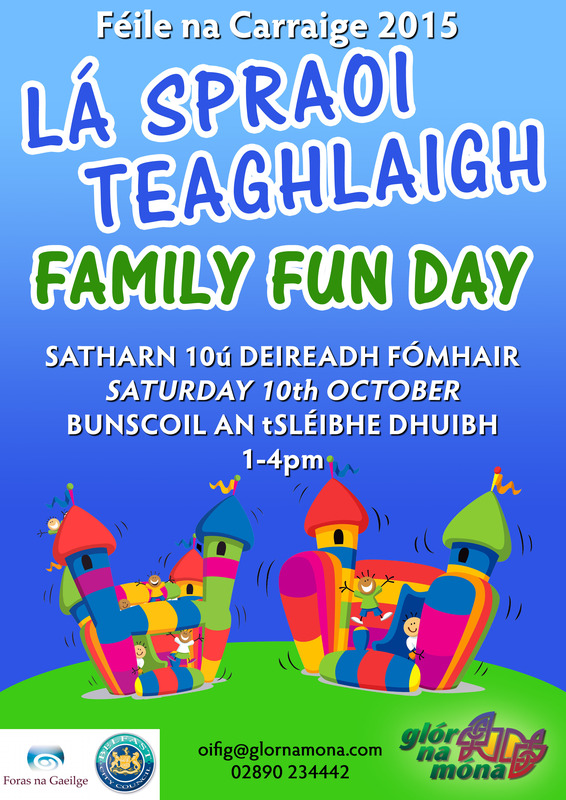 Local community representatives and activists along with pupils from local schools Bunscoil an tSléibhe Dhuibh and Gaelscoil na Móna came out to show their support and enjoy a bit of craic, music and food in Whiterock Library. 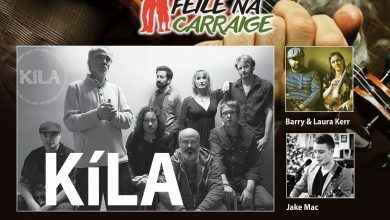 This year’s Féile na Carraige programme is jam packed with events to suit all facets of the community, there will be a music morning in Coláiste Feirste for pensioners, singing workshops facilitated for local school children, Plúra Lúra and na Bopóga will visit local naíscoils and there will be a great fun day for families on the Saturday afternoon in Bunscoil an tSléibhe Dhuibh while the G Spota visits the Upper Springfield promising a great night of music and gaelchraic with J.J Ó’Dochartaigh and Bréag on the Saturday in Cumann Naomh Eoin GAC. 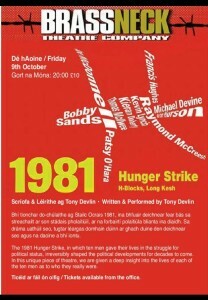 The acclaimed play, 1981 will take the stage in Gort na Móna on the Friday and we will also host our annual Harry Holland Lecture and this year, on the centenary of O’Donovan Rosa’s death Dr Shane McKenna will look at “O’Donovan Rosa: Unrepentant Fenian” along with much more. 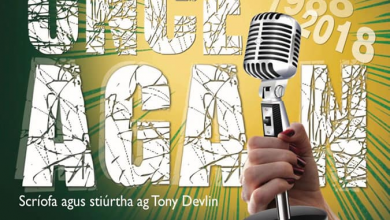 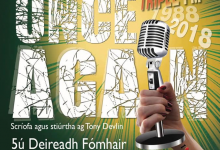 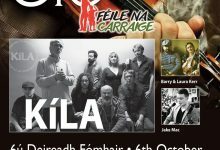 There is something for all in this year’s Féile na Carraige’s programme. 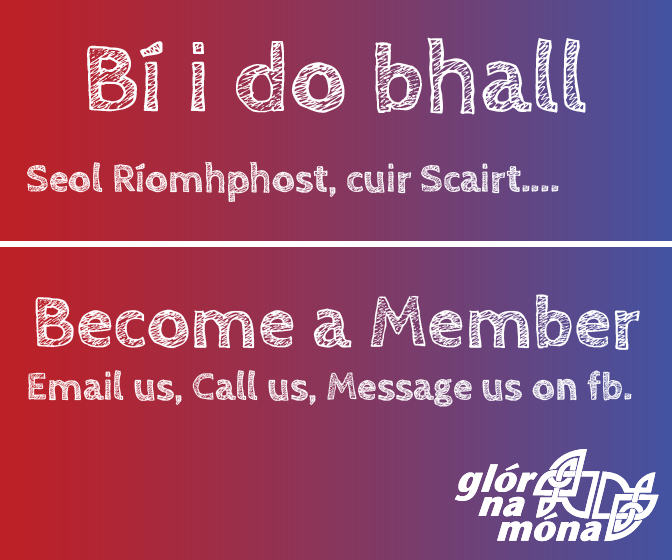 Glór na Móna would like to thank Foras na Gaeilge, DCAL and Belfast City Council for their support of the festival. 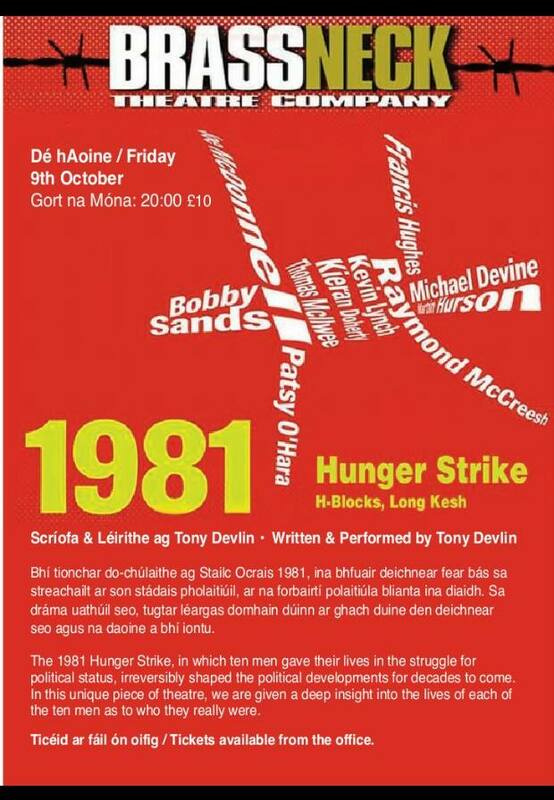 Click below to down load a copy of the festival.